14 x 15 x 5 in. Selected pages from metropolitan phone books are cut away, rendering them limp and flexible like bands of soft fabric. Hung across a wall, the resulting forms appear to float across a horizontal plane, resembling a flock of birds buffeted by a hurricane or a tornado spinning out of control. If imagined in stasis rather than motion, the altered books with their page strips twisted into fixed positions resemble circus contortionists or toys transformed into fantastic architectural shapes. 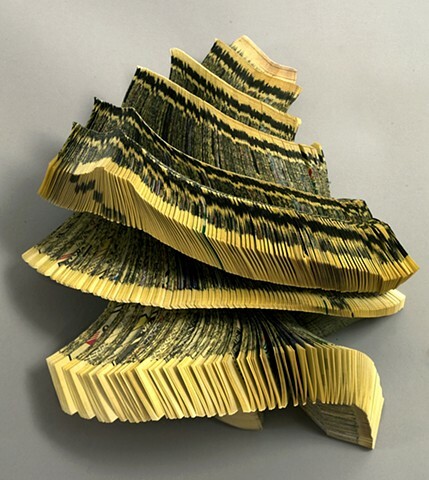 But beyond their physical turmoil and torque, these forms evoke a metaphoric association with the twisting of language itself and how, on and beyond the telephone, as well as in and out of books, language can be used to distort human communication, warping entire communities with its skewed motives.